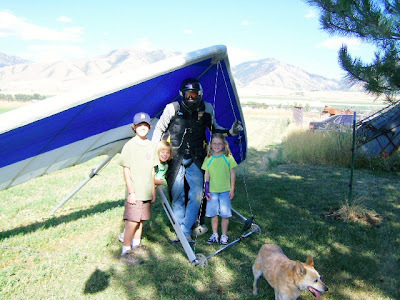 This summer there's been so much blogging about flying adventures, I've neglected a few important moments. Julie, my wife, celebrated her 39th birthday September 4th. I took her to Maza, one of her favorite middle eastern restaurants where we enjoyed the evening with friends. One of my long time music friends came out last month for a week. We spent most of the week writing songs and just having some good times. Saturday started with welding my broken truck rack. I used the truck for staging a zip line that served to load 45 lb. retaining wall blocks down into the side yard of our house. After 275 blocks, a weld on the rear rack failed. Later in the morning Greg and I conversed over the phone about flying, and by early afternoon Jeff, Greg and I were setting up at Inspo. I was surrprised at strengh and consistency of the lift. With smoke in the valley as a result of few Idaho fires and light winds, it just didn't seem like it was going to be a great day. We watched a few bags launch, and as they climbed out effortlessly, our motivation to get into the air shifted to second gear. In near-record time we were all three launched and climbing out. The thermals were small and punchy, but they seemed to converge at a few thousand feet over launch, making them biggger, stronger and more pleasant to core. Jeff was seen from time to time when he slowed below warp speed, but just as he appeared, he would vainish without a trace. 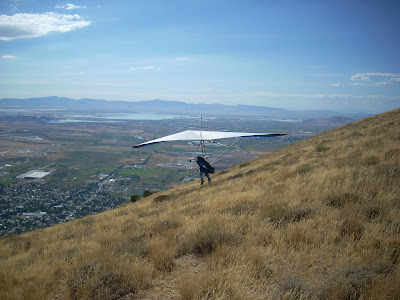 Greg and I followed Jeff south to Rock Canyon, and before Jeff could finish radioing, "lets head for the Y" (a land mark south of Rock Canyon), it was as though a giant sling shot catapulted him forward. 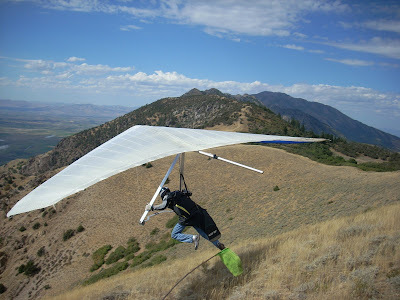 Greg and I opted to follow a scraggly thermal that landed us over Cascade. 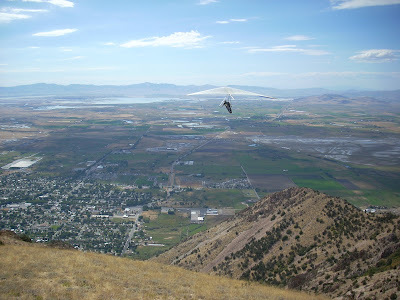 At one point in a thermal over Cascade, we were joined by a golden eagle. Priceless! Later we crossed Provo Canyon and onto the flanks of Timpanogas. 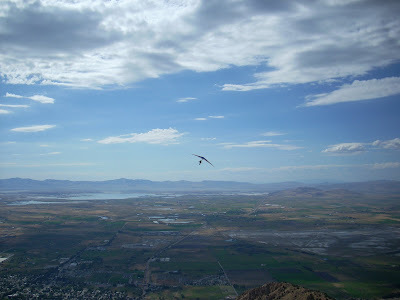 All three of us spent a good 45 minutes or more on Timp climbing out in smooth late afternoon thermals, enoying the great lift and incredible views. Greg's wife Jennifer took some pic's on Saturday and I just figured out how to open the files. 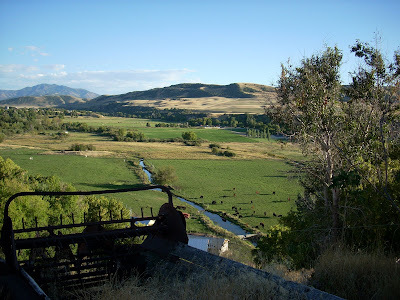 The Wellvilles are a range of mountains slightly north of Brigham City, Utah. It is a perfect formation of crags and peaks that looks as though God designed it specifically for soaring. I have eyed them for years. Everytime I drive up to the Short Divide, I pass the Wellvilles to the west and wonder about the possibilities of flying the perfect range. Cody and Greg flew the Wellvilles in June after being introduced to the site by a local pilot, and since then I have pestered them about flying there. 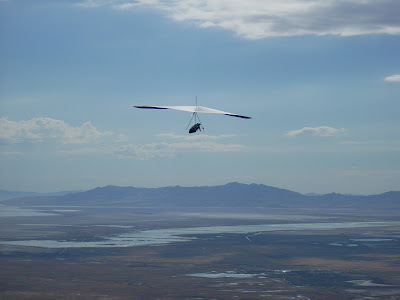 This past Saturday the weather conditions looked poor around Salt Lake for flying and there wasn't enough wind for the Short Divide, so we came up with a plan to fly the Wellvilles with Cody's house (and a barbecue) as our goal - which works because Cody's house is only 8-10 miles to the east, over the back. Finding a driver is always an issue, especially with sites like the Wellvilles. 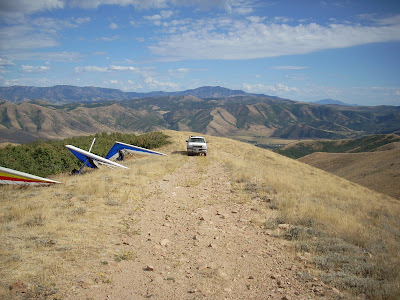 Because the launch area is an hour's drive from the LZ and because the road is very primitive, you don't want to drive back up to retrieve your vehicle. We were in luck! One of my friends from Texas was out for the week and we managed to hornshwaggel (in Texas a word meaning to coerce or finagle) Darryl into driving. 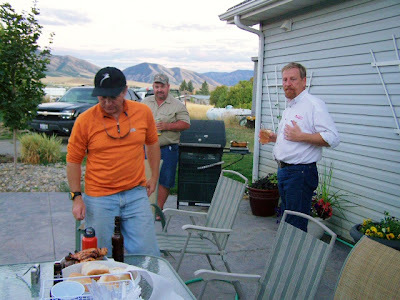 Darryl and I met Cody and Greg in Brigham City around 12:30 pm, and before long we were on the road to the Towers launch. The road to the top is in my book a catagory 4-5, with 5 being the nastiest, scariest road I've been on. Along the way to the top Darryl could be heard muttering short sentences under his breath like, you crazy fools do this for fun?, as well as making reference to situations where one might have brought along a case of pampers. At one point for meanness Cody locked the doors and sped up the truck just to dispell any ideas anyone might have about abandoning the truck. So we made it to the top without incident, and we were rewarded with one of the most beautiful launches I've been on. 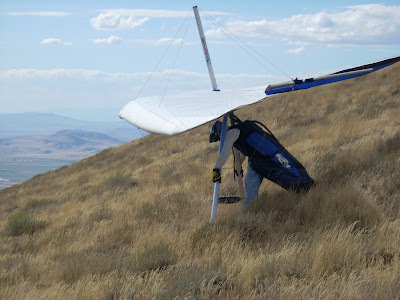 We quickly set up in the afternoon breeze, and before long I was launched and circling in a little disorganized core above a craggy spine just north of launch. The thermal amazingly came together, and I was soon a few hundred feet over launch. The boys were quickly suiting up and making their way to launch as I was coring my way to a thousand feet over. Greg and Cody took off close together and were soon making the best of the late afternoon lift. At one point, in the words of Darryl, Cody was well below the prominent point in front of launch and out of site when he meandered into a decent core that saved him from a premature landing. The boys stuck it out in the light lift for another 45 minutes and managed to climb out to a thousand and some change over. Greg was the next to go over the back and with his altitude managed to fly to Pisgha Peak, which is the mountain directly over the back. 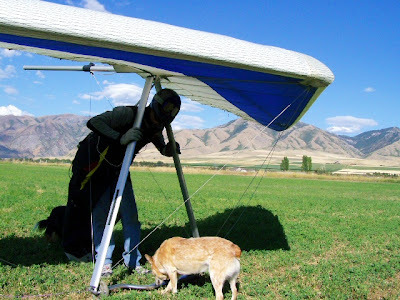 Greg was amazed to see Cody venture over the back, being only a few hundred feet above launch, the Code Man got drilled and ended up landing in Sardine Canyon. 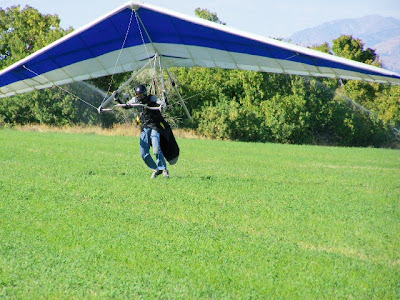 Greg soon found himself out of lift and low and opted to land in the same wash Cody had landed in earlier. 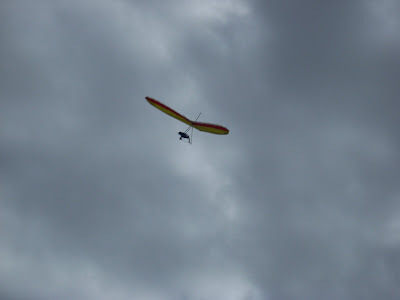 I was able to manage a bit more altitude and squeaked over the back. I landed at the Dobson's residence after conversing with Cody several times on the radio regarding the location of his house. 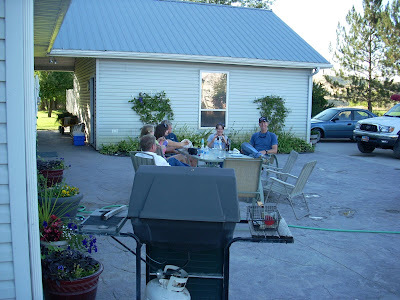 We all ended up at Cody's house where we had a great barbecue and enjoyed the Dobson's awesome digs.